Jake Quckenden’s X Factor 2014 bid is over as he was sent home last weekend. Mel B, Jake’s mentor, sobbed as the verdict was read and her sadness was very apparent. The sing-offs were all rather shaky, but the band Only The Young managed to stay in the competition another week at least. Louis Walsh is happy that his band stayed in. The competition is getting very tight with the remaining X Factor contestants. As Jake prepared to take his final bow on the show, he told host Dermot O’Leary: ‘Honestly, I’ve met some absolutely amazing people. ‘I’ve got a lot more to give and you never know what’s round the corner and I just want to say thank you to the judges and, you know what, it’s been an incredible journey. In the earlier sing-off against Only The Young, Jake nervously performed his rendition of Daniel Merriweather’s Red. Only The Young took to the stage next, singing the apt Abba classic The Winner Takes It All. The singers belted out such lines as ‘the judges will decide’ – much to the delight of mentor Louis, who sang along word for word throughout their performance. And once it was time for the judges to make their decision on who they wanted to send home, Simon Cowell admitted he was none too pleased with either of the performances. ‘I don’t know what is going on with these sing-offs at the moment, but they were both horrible. The vocals were all over the place,’ he moaned before voting to send Jake home. With Louis understandably voting to send Jake home as he saved his own act, the final decision was down to Cheryl Fernandez-Versini, who said that while she enjoyed Jake’s ‘passionate performance’ she was sending him home. Speaking after the show in the Tresemme hair salon – and after Simon Cowell predicted she would be in the bottom two – contestant Lola Saunders told MailOnline: ‘I think I was an emotional wreck but I sort of like hearing the negative comments because it makes you all the more determined. 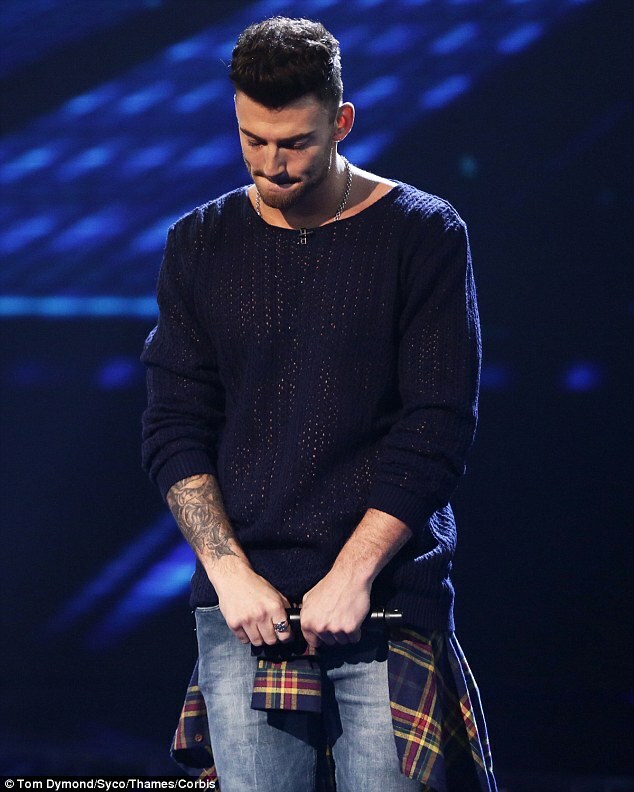 Jake Quickenden is out of X Factor 2014 but he stays bright about his performing career. He says he’s not finished yet and will further hone his place in pop star fame. Mel B was very upset as Simon Cowell tried to console her. These contests are not without their heartbreaks and tears, felt equally by mentors and contestants alike. But it has to be so; only one can win. Our best to you in the future Jake.